1900 Cherokee Nation, Indian Terr., Twp 19. 1910 Owsley Co. KY Annotated Census by R.L. Smith, grt g/s of Frank Finley Bowles. Headstone at Griffith Cemetery observed by Betty Thomas Finger, and KY Death Index, 1911-2000, on Ancestry.com. 1850 Breathitt Co. KY Census, Dist. 1, HH 272. Nancy Frost Moulton, 3rd grt g/d of Margaret Walkup & William Gay - from the UK program at Ancestry.com. Ref: J.P. Downard, Louisville KY, genealogist & descendant of Martin Couch thru son,Ira. There is a George McCollum on the 1840 Clay Co KY Census, b. 1810-1820, alone with 3 children under 5. The only McCollum on the 1850 Clay Census is Isaac born 1798, married to Mary A. Civil War Pension Record of son, William. 1860 Owsley Co. KY Census, HH 422 - Edmond. 1870 Owsley County KY Census, Indian Creek Precinct. Based on age of first child on 1850 Scott County, VA census. 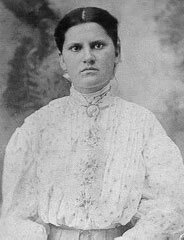 Betty Bowman Gabbard, granddaughter of Jacob Bowman and Emily McQuire. 1850 Scott County, VA Census. The 1850 Daviess Co. IN census notes that Samuel is a Justice of the Peace. This couple is either the grandparents or the parents of Samuel Smith, born 1833/36. 1850 Daviess County IN Census, Washington Twp. 1880 Newton Co. Arkansas Census, Jefferson Twp., HH 24 - 1875. Judy Tate, descendant of Vincent W. Thomas & Sarah Spivey. Alisha Tirey, wife of Jayson Lee Tirey, who is the grt g/s of Bradley Tirey & Della Hughes. Civil War Pension Record of Amos Tyre/Tirey. PAGE: Dependant Mother's Claim, dated Sep. 27, 1889. James Bowman work from Owsley Co. KY Library, Vol 2 P. 404 - "Colonel". Extracted Clay Co. KY birth records for 1861 on microfilm at LDS.